3.Engineered for use in deviated and horizontal applications and cased hole and liner overlap. 5.Rib design allows for optimized fluid flow in the annulus. 1.This hinged non welded positive casing centralizer uses hinged pins to secure the hinged designed end collars together around the casing. 2. The positive casing centralizer consists of straight formed positive bars, which are attached using rivets onto the hinged end collars. 3.The design is hinged for ease of installation and is normally run over a stop collar or coupling. 4. 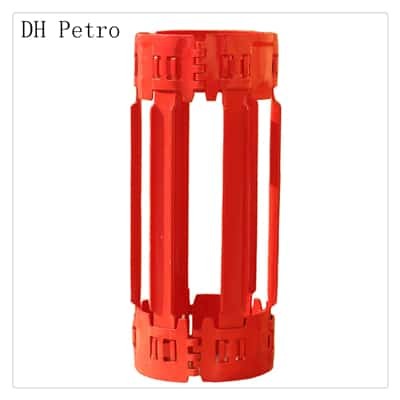 Non weld Positive Centralizer are Provided with rigid bows of U – Profile design instead of spring bows to ensure maximum fluid passage and reduces frictional drag force in deviated hole conditions . 5.They provide almost 100% standoff when run inside a cased hole. 6.The flat U profile is fitted in self locking retaining lips for firm and positive hold. 7.Bows can be selected to meet any hole Size from a choice of ten standard U profile depths and bow heights. 8.Hinged non weld positive casing centralizers are available in sizes 4-1/2″ to 20″. 9.Any special sizes or combinations are available on request.